Your post-purchase thank you page URL. Note: The ULR you enter must match exactly the website URL. If you’d like to track multiple versions of the URL, you’ll need to use a wildcard. Our assumption is that no one can see the thank you page without actually buying anything. So, whenever someone visits the post-purchase thank you page we’ll mark such visit as a successful purchase. 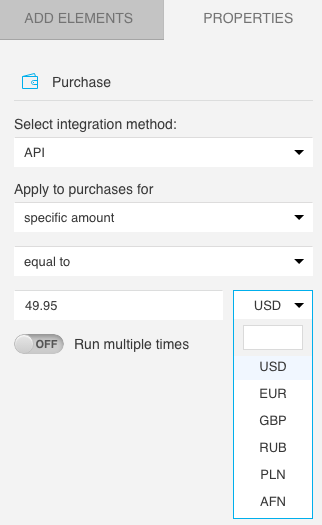 You can define a specific purchase amount for the condition if you’re using API to integrate your site and your GetResponse account. 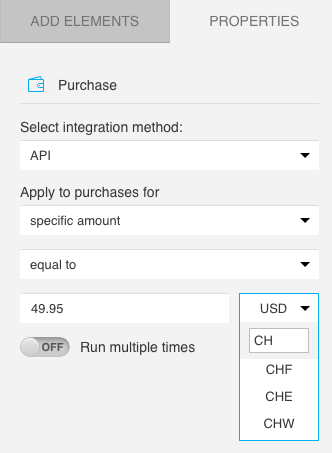 When you select API as the integration method, the amount options become available in a drop-down list. 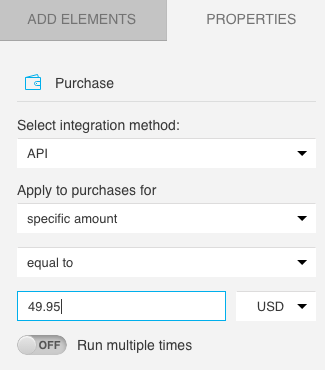 By default, the element properties are set to any amount. Expand the list and select specific amount.